My bungalow, and family home, had been lived in by half a dozen different families during its 50-year life time. It stood up to numerous severe storms. But Dover District Council illegally destroyed it in less than one hour. On Monday the 31st July 1989 Council officials arrived, accompanied by an outside contractor with a mechanical digger and a lorry. The Council had engaged the services of W. Brazil, a small firm from Thanet whose main line of business was skip-hire and tree surgery. The day before the demolition, on the sneaky instructions of Dover District Council, the Electricity Board and Water Board cut off our electricity and water without even consulting us! 1. Did I demolish the original bungalow? After a great deal of hesitation, whilst being pressed for a one word answer, he finally and very reluctantly said, NO, I had not demolished the original bungalow. 2. Did I properly purchase a residential dwelling? After yet more hesitation and stuttering he finally admitted YES I had properly purchased a residential dwelling. Was the bungalow rated as a residential property? 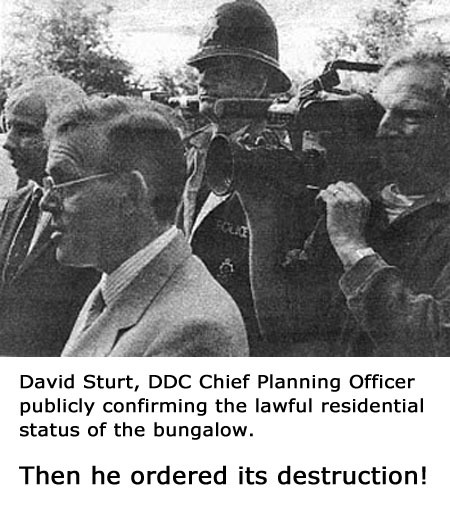 Yet despite publicly admitting the lawful residential status of the bungalow Mr Sturt ordered its destruction. The Chief Inspector of Dover Police then asked to enter the property, which I agreed to, and after a lengthy discussion we came out for the sake of our two young children. Then the mechanical digger drove up to the bungalow with its hydraulic arms slowly raising the front bucket. It then repeatedly brought the heavy bucket crashing down on to the roof and literally smashed our home to pieces, making light work of the timber framed bungalow. We could do nothing but just stand and watch the devastation. Whilst Jim Horn, the Council’s solicitor, and David Sturt, the Council’s Director of Planning, smirked at each other obviously enjoying the experience. After destroying our home the Council reported in the local press, that they were not obliged to provide accommodation for us because we had ‘made ourselves homeless’. It was a shock to see them smashing it to pieces because the Council had informed me that they would dismantle my bungalow and then take the materials to their depot and store them. Adding, that if I did not pay their costs for demolishing my own home they would then sell the materials and use the money to pay for the demolition. This was yet another false statement from the Council. What they actually did after they had smashed the bungalow to pieces was to immediately load all the debris onto the back of a lorry. I was later informed by somebody who followed the lorry [name supplied], that it was taken to the refuse tip and dumped. It was a case of getting rid of the evidence quickly because if a forensic test had been carried out on the timber frame it would have confirmed that it was indeed the original timber frame, as I had repeatedly stated. But maybe that’s why they got rid of it so quickly, to cover up their wrongdoing. Prior to Dover District Council demolishing my bungalow they falsely stated that I had ‘erected a new bungalow’. But that was not the case! The fact is that I renovated the bungalow and the original timber frame remained. There was no increase in its size and the renovated bungalow occupied exactly the same footprint. I purchased my bungalow on the 15th June 1984, yet at a Planning Committee meeting dated Thursday 9th August, just 7 weeks later, the elected members voted to demolish it. The decision was made based solely on false information presented by the paid officials and without considering any representation from me. There is overwhelming and indisputable evidence to prove that I did not demolish the original bungalow nor erect a new bungalow. David Sturt, who at that time was Dover Council’s Chief Planning Officer, confirmed that the original bungalow was never demolished. He confirmed this on the day of the demolition, witnessed and filmed by both the BBC and ITV. There is a statement from the carpenter who carried out work on my home confirming that the original bungalow was not demolished. The above extract of a letter from the Council’s Legal Department proves that the original timber frame remained in-situ throughout the works of renovation thereby confirming that I did not demolish the original bungalow and erect a new one, as the Council wrongly claimed. And of course, there is the final and compelling evidence as Dover Council destroyed the bungalow. 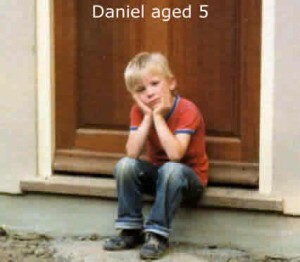 It was clear for everyone to see that the timber frame was not new, but the original frame, as I had always stated. 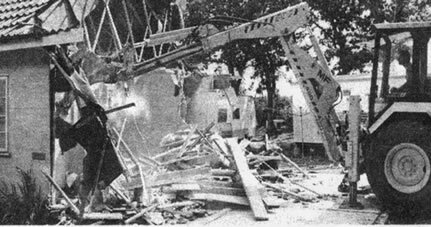 The Council’s Solicitor, Mr J. Horne, watched closely as the mechanical digger was crushing the bungalow. My wife approached him and pointed out that it could clearly be seen that the timber frame being destroyed was old timber and obviously the original, as constructed in 1928. His flippant reply that “anyone can make new timber look old” was particularly insensitive and most importantly totally wrong. It is nonsensical to think anyone would consider making new timber look old if it was to be concealed behind cladding. The Council’s action has never made any legal or moral sense to me or anyone else who has taken the trouble to scrutinise what they did and how they went about it. Their actions were, and continue to be, totally inconsistent with the facts and indeed unlawful. The Council stated that I had erected a new dwelling when they knew full well that I hadn’t and this false and misleading information was presented to both the Planning Committee and the Planning Inspectorate. This shows that their motives were malicious, reckless and amounted to deliberate deception. DDC are the experts in planning law and use the Town and Country Planning Act as the bedrock for what they do and are supposed to be competent in the use of the law, which they use to control others. Therefore they cannot use the excuse that they made a mistake.